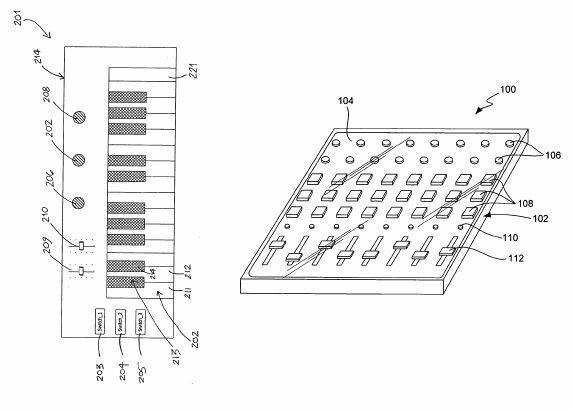 More Apple Patents Suggest New Music App, Musical Instrument? At the very least, it looks like Apple is working on significant new music software features, as you might expect. But depending on how you read their patents, new music hardware — even touchscreen hardware — could be in store. There seems to be ample evidence of a touch screen interface for the next Apple offering. There are a few other interesting tidbits in the patent applications as well if you’re into to reading this stuff. Some of this is old news: synchronized audio to multiple devices was rolled right into the operating system in the form of network communication and device aggregation features. But what’s that about a “frameless music keyboard”? Or a “touch-sensitive media device”? Let’s talk about the touch-sensitive media device first. Multi-touch Music, a la Lemur? It sounds a lot like the iPhone, but as I noted shortly after Macworld, this particular patent has Dr. Lengeling’s name right alongside Jonathan Ive’s, and describes elaborate audio mixers and music keyboards and sophisticated multi-touch gestures. None of these would be possible on the tiny iPhone screen. Before you get too excited, just because a company is working on an idea and patents it doesn’t mean it’ll get into a shipping product; there are countless intervening steps. If you’ve followed Apple’s design history, you’ll know the company was working on phones and boomboxes in the late 80s that never materialized. On the other hand, Jobs hinted in his iPhone keynote that he’s aware that paperwork can tip your hand. (In the case of iPhone, it was an FCC filing, but Apple product hints have snuck out in patent applications, as well). A New Logic? Equally interesting is that this stream of patents hints at the plot line of the post from early today: Apple has a next-generation music app, and they’ve been working on it for five years. That’s the rough time period of the various application features here. As I read the patents (always a challenge), it sounds like the “graphical” methods of displaying audio and video signals and what looks like automatic beat detection and tempo correction features are beyond what we’ve seen in existing apps. It’s possible the “graphical” audio display is just the spectrum view in Soundtrack and the tempo correction bits are related to Apple Loops (again, even experimental ideas that may not have gotten into the software), but it seems possible there’s a longer-term project here, as well. The honest truth is, it could all be meaningless. In the meantime, feel free to dream. And this being CDM, feel free to continue to create your own wild inventions — they could prove to be cooler, or real-er, anyway. Rumor Mill: No Logic 8; New Touch-Sensitive “Pro Tools Killer” Instead?